Cacani 2d software with automatic inbetweening done right - Welcome to TVPaint Community forums ! but the potential of the technology is impressive, i like the interface for the spacing of the inbetweens. I don't think it should be used for character animation. but as a tool for doing sfx i can see it being very powerfull. Yeah absolutely. I've also used some twixtor in the short I'm currently working on, but not for character animation only for camera moves with static characters. In some shots the character looked kinda flat if I only sled them from left to right in a panning shot, so I drew them on the first frame of the pan and on the last frame before they left the frame (considering the parallax movement of arms, legs etc.). Then I used twixtor to morph between the two frames. Sounds a bit like taking a sledgehammer to cracking a nut, but in some cases it really helped selling the shot. Cacani is really clever especially for cleanup and inbeetweening (as long as you spend the time to understand how it works... There is a lot to think about while drawing to match the strokes and it can be confusing. TVP in definitely more intuitive as it's only drawing). It's still not that handy for animating, to me, but it makes me dream a little haha. Hope to be able to clean an anim with it someday. Also you can't really have something else that a vector line, maybe you can do something with it with some compositing but that's another drawback. I would use it more like something to assist me whil I inbeetween then redraw/transform everything to find my arcs and drawing again (note that there is a nice system to inbeetween with arcs, and with the time charts it's not just linear inbeetweens). But it's a really bad learning tool if you wan't to learn animation. 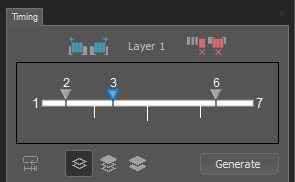 I use twixtor for slow animations with a lot of inbeetweens, but only if the frames are pretty similar (I've even spotted it used in some Avatar shots haha, so it's happening in production also). I found that the other functions of the plugin are not that usefull for animation. But I would like to see a twixtor-like function in TVPaint, as it can be usefull for a lot of speed effects. But I would definitely use cacani for some cleanup and inbeetweens as the cleanup tools are great and you can still animate a lot by yourself if you like full anim. They used similar techniques with after effect puppets at dreamworks on the kung fu panda 2D part, as long as it's well animated the tools can let you save a lot of time. But animation was still done on paper by james baxter, knowing what are the keyframes painted and textures in photoshop and what should be interpolated. Perhaps there could be a different software or a TVP plugin that can make it work with raster graphics. This 100%. It would make very interesting sfx. This looks amazing. This tool would be definitely be quite handy for certain scenes, such as when the camera is turning around the character. There is beauty in imperfections. The only emotion associated with mechanical perfection is, "Wow! It works!" How is that going to make a story engaging? Are you saying that this doesn't fit in with frame by frame animation at all? I am not saying that. I am trying to make a point that it makes little sense to animate 2D films in a hand drawn app so that they look as close to 3D animation as current technology will permit. There is beauty in the imperfectly drawn animation that will always be missing in computer generated lines. The soul of the animator shows up within his/hers imperfectly drawn lines and the audience will instinctively warm up to it whereas the artist's soul is completely missing where the animated lines are mechanically rendered with cold perfection when generated by a computer, leaving the audience indifferent to it. I am glad TVP is still adhering to its original mission to serve the 2D hand drawing community. The problem with those YouTube examples is they're done by amateurs, usually titled "test", etc. and often times not animators at all, so couldn't possibly begin to express any animation principles, not to mention the keys are always too far apart without any breakdowns, I could go on. I've been using CACANi since launch, pains me to still see these kinds of videos used as examples, they really need to make some solid promo content. The only project off the top of my head I know that publicly state "powered by CACANi" is Hataraku Saibou (Cell's at Work) explained here: https://wowjapan.asia/2018/07/hataraku- ... onnection/. I still prefer to hand-draw my characters, but for things like fire, smoke, explosions, glimmer effects, plants and props it's sooo good not having to tween that stuff anymore. But why even those elements? I prefer 2D films where the animator brings imagination and a personal touch to animate even elements and mechanical objects such as automobiles and hand drawn zooms or pans of entire backgrounds rather than the mixtures of hand drawn and mechanically generated inbetweening. It might make it easier for the animator to let a clever computer graphics software do some of the more tedious work but in my view this ruins the overall impression resulting from such films. I guess I'll always prefer a pure impressionist's painting to a painting with photographic collages inserted in the mix even though both techniques are equally respectful in the eyes of important reviewers. So perhaps my views will always reflect my age and cultural background but there's no right or wrong even in those sort of reflections. To each his own. But why even those elements? Time and money. But with things like that there's almost no way you can tell the difference. I used to be an FX animator but when I learned how to use Blender and Flash I remember thinking to myself a lot how much time I wasted hand-drawing this stuff, because I was producing higher quality work in much less time. I prefer 2D films where the animator brings imagination and a personal touch to animate even elements and mechanical objects such as automobiles and hand drawn zooms or pans of entire backgrounds rather than the mixtures of hand drawn and mechanically generated inbetweening. I do too, if I had time I'd do all those things, it's an unfair industry with little money for the workers. However there is a misconception about CACANi; yes it will auto generate inbetweens but often you'll say to yourself "that's the frame I wanted" regardless. It incorporates true animation timing, if I draw a time chart out by hand I can match it up in CACANi in the timing panel and generate inbetweens based on it, including holds. There's no community for CACANi so it's interesting to see a discussion about it once in a while, very lonely sometimes. Last edited by Jet on 26 Aug 2018, 23:19, edited 2 times in total. But by generally established standards it is considered unethical to discuss the workings of other software on the forum of the current software. I understand that references are fair information, but to carry over another software's merits and demerits on this forum just because they have no forum of their own is like a cowbird laying eggs in other bird's nests. Such birds are called brood parasites. I didn't create the thread and I also don't appreciate being compared to a parasite if you don't mind.